This was the car I drove when I was in high school. It was also the car my mom drove. We shared this car, meaning that I didn’t drive it as much as my mom did. 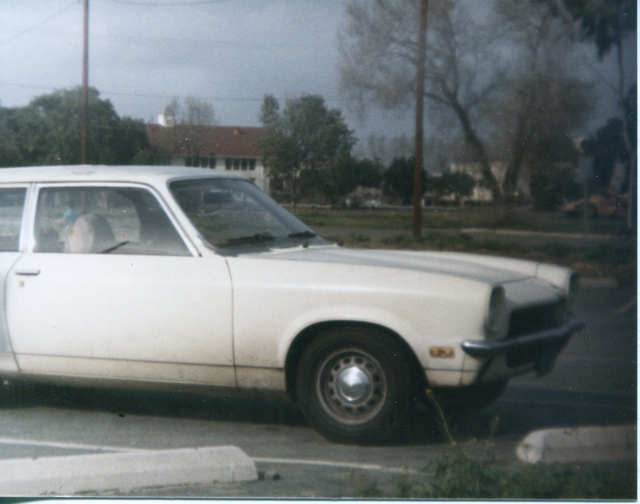 She paid $350 for this car sometime before I started in high school in 1977. Which means it was about 5 years old when she bought it. Cars were cheaper back in the 70’s. The above photo was taken in 1985. This Chevy Vega had been through many repairs in the 8 years my mom owned it. She sold it not too long after this photo, replacing it with a 1979 Honda Accord sedan that she paid $400 for. I don’t think my mom paid more than $1000 for any car she every owned. I have many memories of driving this car, getting into an accident in 1981 where I rear ended a 1958 Mercedes and did $1,000 worth of damage, taking dates in this beat up vehicle that always provided some type of mushy ride. I don’t miss this car, but I am happy to have memories of it. These days, I feel like you’re lucky if you can get tired for $1000. Oh yeah. The most recent tires I put on my 2012 Sentra were almost $600 and I got a discount on those thanks to a Midas coupon.